Best-in-class colour assessment. Excellent viewing conditions for reliable decisions, under consistent lighting to international standards. 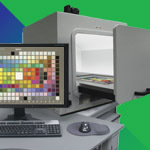 Non-contact colour measurement and imaging system, created specifically for industry needs for increased objectivity for colour. Fast, reliable and expert service, delivered from stock; including Pantone SMART fabric swatch cards in all 2131 textile colours. The comprehensive range of 2,328 colour coatings and finishes on various substrates and formats for designers, specifiers and industry. Assessment for colour consistency, VeriVide technologies provide high quality colour rendering products to a naturally occurring problem. 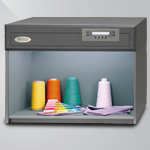 Effective supply chain colour management can achieve higher quality, greater production efficiency and reduced waste. Are you involved in colour assessment decisions? VeriVide provides comprehensive testing for areas of colour vision deficiency. From automotive to printing, VeriVide’s colour assessment and measurement technology helps ensure conformity, consistency and quality.